On Friday, the Guyana Police Force ‘D’ Division launched a new boat which is powered by a 85 horse power (hp) Yamaha engine. 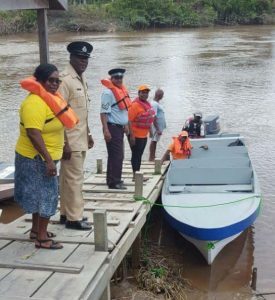 The vessel ‘Lady G’ made its first trip to the Bonasika Outpost with the Officer-in-Charge of the No.1 Sub-Division, Assistant Superintendent Alwin Hoyte, along with Sergeant Allison Daniels who is the Subordinate Officer in-Charge of Parika Police Station and other ranks, on board. The 22-foot fiberglass vessel which was captained by Police Coxswain, Corporal Doodnauth Bridgemohan, will be used to patrol the expansive riverine areas of the Division.